Cubs starter Jake Arrieta did it all Sunday, and walked off the mound with another victory in hand after he outdueled D-backs starter Shelby Miller in Chicago's 7-3 win at Chase Field. The Cubs are 5-1. It was Arrieta who gave the Cubs an early lead with his two-run home run in the second inning -- a blast that landed 440 feet away, according to Statcast™. A double by former D-backs catcher and fan favorite, Miguel Montero scored Tommy La Stella to give Chicago a 3-0 lead in the fourth. 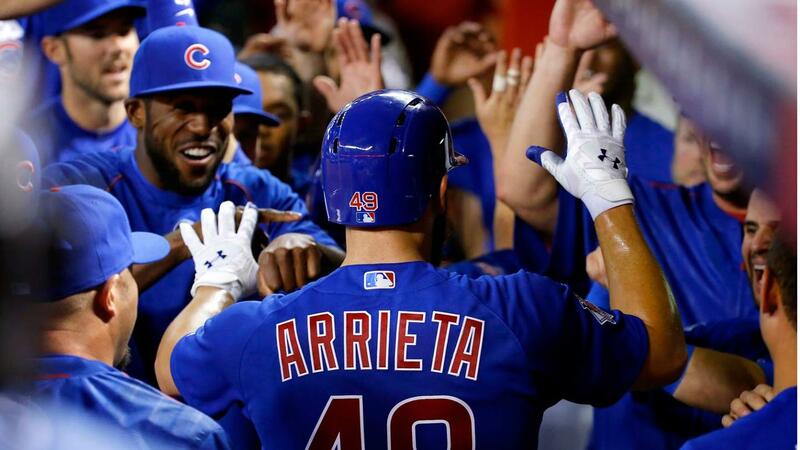 "It's a special time in Chicago, obviously for Cubs fans but also for us," Arrieta said. "It's what you live for, starting a season off like we have and going home to play in front of your home crowd is a special feeling." Arrieta gave up three runs on eight hits in seven innings for his second win of the season. The reigning National League Cy Young Award winner also struck out six. For his part, Miller was charged with four runs on seven hits in five innings for the loss. "I think he battled," D-backs manager Chip Hale said of Miller. "I put him back out there with about 90 pitches because I thought his best inning was the fifth. I felt like he was getting stronger. He just left a slider up to [Jorge] Soler, but he battled through it." D-backs first baseman Paul Goldschmidt cut the Cubs' lead to 3-1 and snap the right-hander's scoreless innings streak at 32 innings with a home run in the fourth. Right fielderDavid Peralta followed with a double and eventually scored on a single by Jake Lamb for Arizona's second run. The Cubs put the game away with another run in the sixth and two more in the seventh. Soler power: With Kyle Schwarber out for the season because of a knee injury, left field is open. Cubs manager Joe Maddon was hoping Soler would take advantage of the opportunity, and the outfielder made a statement by hitting a tie-breaking homer leading off the sixth. Soler added a sacrifice fly in the seventh. He hit 10 home runs last season in 101 games, but also launched three in seven postseason games. Soler struck out in his first at-bat, but recovered well, which is something the Cubs want to see more. "His at-bats got better during the course of the game," Maddon said. "We get him out there with those strong mental at-bats and the sky's the limit for him." Lift off: Arrieta helped himself in the second with his third career home run. He fell behind, 1-2, against Miller, and battled the right-hander to a full count, launching the eighth pitch of the at-bat into the bleachers in left center. Arrieta, who saw nothing but fastballs in the at-bat, drove in Montero, who had doubled. Goldy Gone: Hale shrugged off a question about Goldschmidt's production and his high number of strikeouts (nine) during the first week of the season Sunday morning. A few hours later, his first baseman made him look like a genius when Goldschmidt smacked a double in first inning and launched a solo home run in the fourth, his second homer of the season, to cut Chicago's lead to 3-1. Goldschmidt struck out in his third at-bat. He finished 2-for-4. Socrates Goes Deep: Socrates Brito is not just happy to be here. Just ask him. The rookie outfielder, who has been thrust into center field after the injury to starter A.J. Pollock, hit his first career home run in the fifth inning to tie the game at 3. With the outing, Arrieta extended his franchise record to 22 consecutive quality starts. He is 18-1 in those 22 starts. In the Chicago sixth, Addison Russell was called out at first after hitting a ground ball to third baseman Lamb. The Cubs challenged the call, and after review, the call was overturned and Russell was safe. Cubs: With the win, the Cubs head to Wrigley Field to play their home opener Monday night against the Reds. Jon Lester will start in the first of a three-game series. This will be Jason Heyward and Ben Zobrist's first games in home whites. Dexter Fowler is expected back in the lineup. First pitch is scheduled for 7:05 p.m. CT.
D-backs: Patrick Corbin will take the mound Tuesday at 1:10 p.m. MST against the Dodgers in Los Angeles, the first of 10 road games against National League West foes. All four of the runs Corbin allowed over his seven innings against the Rockies in his last start came via three home runs. The D-backs will also face the Padres and the Giants on the road trip.